Now that we have covered crossing the US – Canada border with your boat, and with sunny summer days ahead, it’s time to talk about the world-famous cruising grounds right in our back yard – the San Juan and Canadian Gulf Islands. The barriers to entry are not insurmountable, but some knowledge of the straits, narrows and rapids in this area are necessary. The rocks and coves, picturesque and inviting, also represent hazards to be avoided. That is the beauty of this cruising area – be aware of and manage the risks and enjoy the rewards! This Tech Talk will discuss routes, wind and weather considerations, dealing with currents and narrows and those ports of call and spectacular anchorages that grace the cover of cruising guides. We will cover the area from Anacortes to Nanaimo, and, if time permits, a bit of information about crossing the Strait of Georgia to Secret Cove and points north. 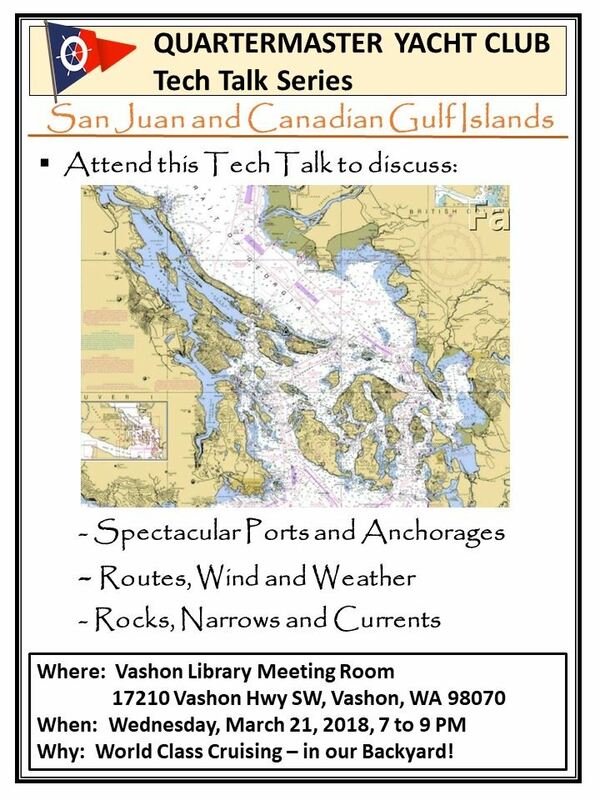 Be prepared to share your own San Juan / Gulf Islands travel tips at this Tech Talk on Wednesday, March 21 at 7PM in the Vashon Library meeting room.